We've been compiling some amazing Porsche models on eBay for over two years now, and we've seen some pretty astonishing cars pop up now and again. This week, thanks to some inspiration from SEMA, we focused on slant-nose 911s (the good, the bad and the ugly) another kit car we can't quite figure out and a very clean 914 we just couldn't pass up. Keep in mind, some of these cars could be great collection investments, while others might prove to do more financial harm than good. When Porsche's 935 race car started to dominate at the track, aftermarket body part manufacturers were quick to start offering kits that would allow "regular" 911 owners the ability to ape the look on their street machine. As the slant-nose look grew in popularity Porsche decided there was enough of a market for them to get in the game, too. All you had to do was order a 930 Turbo and the "Slant Nose" option and Porsche would send your car off to their "special wishes" department where it would become an official "factory" version carrying option code 505. The 911 for sale here is said to be one of those 984 factory produced cars and a 1-owner version to boot. Pricing seems a bit on the high side to us as compared to others currently being offered for sale, but then again the super low-mileage and 1-owner history make this particular slant nose very collectible. Not all slant nose 911s are created equal, and this listing is a great example of that. Built on a 1967 912 this looks to be an older fiberglass conversion that has seen better days. It's examples like this that originally turned me off of the whole slant nose look. While I'm coming around to the factory cars and the 964 flachbau version, poorly done conversion just leave a bad taste in my mouth. If you can get past the fiberglass and the "surface" rust, you might have a decent 912 project on your hands depending on final price. While we're on the topic of body kits, we stumbled across this replica of a 1967 Porsche 917 D. Wait. What? A 1967 917? Okay, so we're not quite sure what this is supposed to be, but it does have one of the better fiberglass body kits we've seen in quite sometime. Couple that with the fact that it has a rolling chassis complete with a Chevy 350 and considerably more parts, this would make an interesting project for someone trying for the look of a 917 on a tiny budget. 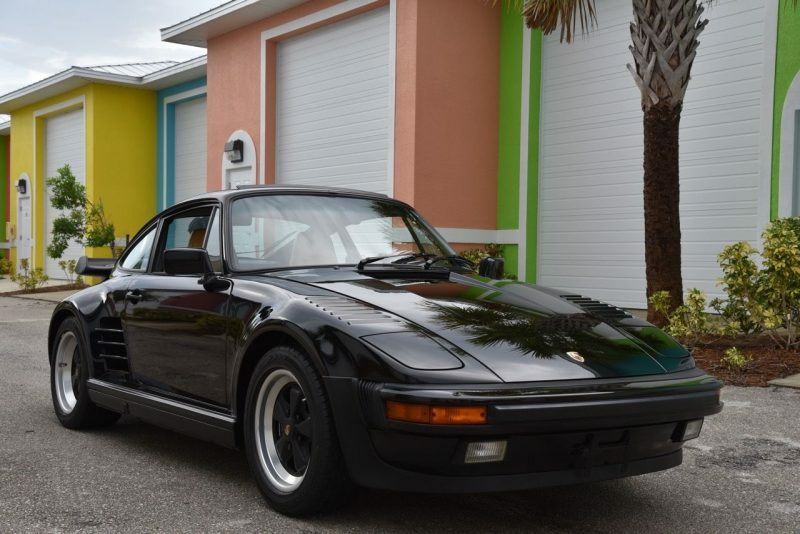 Now here's a much more mildly priced 930 slant nose that appears to be nicely optioned. Not to mention it has the classic "cocaine cowboy" color combo of Grandprix White over Crimson Red interior. The option list was well checked and pictures show it to be in good condition. Get yourself a thorough PPI, throw on your best Sonny Crocket linen blazer and head down to Miami for a weekend of fun! This two owner 914 is said to have matching numbers and still wear its original paint. If that isn't enough to interest you, the seller claims the tub and battery box are both rust free and the engine still makes use of its original fuel injectors. I like the summer yellow paint and the contrasting Porsche script on the doors. The cashmere leather interior coupled with the appearance package make for an overall great presentation. Not sure how high the bidding will go on this 914, but it's definitely one to watch.